Brussels Sprouts. Are you a fan? 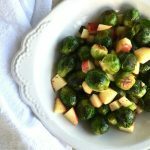 This recipe for Sautéed Brussels Sprouts and Apples is quick and easy and will probably be the most healthy dish on our Thanksgiving table. With a table full of brown, white and yellow, Sautéed Brussels Sprouts will add a beautiful pop of color to your holiday spread. I love a variation of textures, shapes and colors on my table. Sautéed Brussels Sprouts and Apples add bright colors and a cute little round shape to break up the sea of creamed, mashed and pureed dishes at Thanksgiving. Wash Brussels sprouts, trim off a bit of the stem end and peel off a few of the outer leaves. With fry pan over medium high heat, add one tablespoons olive oil. Add Brussels Sprouts, salt and pepper (about 1/4 teaspoon of each). Cook for 5 minutes on medium high heat with lid on, shaking the pan to evenly brown. 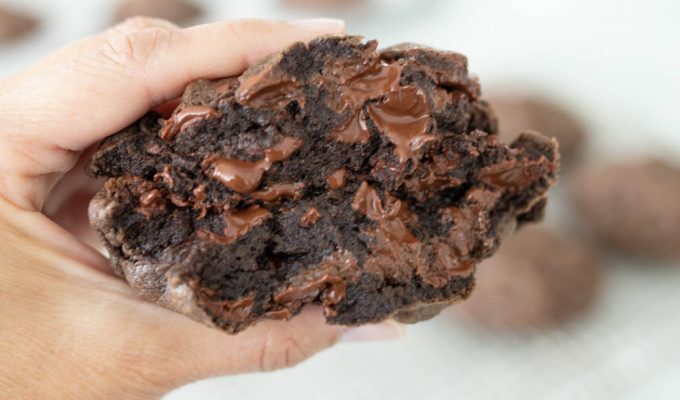 Add the apple chunks and 1/4 cup water slowly. Cook for about 3 minutes minute more with lid on. Toss with a bit of fresh lemon juice and transfer to serving dish.